Shanti explores diverse musical expressions with her crystalline voice, transcending genres beyond her base in jazz. In June 2011, the vocalist embarked on her first European tour. Basking in the afterglow of success, in the following interview she talks about the valuable experience she gained while on tour and about one event on the tour agenda: Japan Expo, the world's largest festival dedicated to introducing Japanese culture, held in Paris. ──Tell us about your tour of Europe in late June. SHANTI: I performed in Paris in France, Cologne in Germany, Madrid and the northern region of Asturias in Spain, and Lisbon in Portugal. On the last day, I went back to Paris and appeared at Japan Expo, held in the outskirts of the city, for a total of six shows in four countries. ──Was this your first European tour? SHANTI: It was, yes. I had wanted to perform in Europe for the past two or three years. One inspiration was recording the 2008 indie album Share My Air in France. I knew there were many amazing musicians in the country, so I imagined the audiences that support them would be amazing too. This tour was a dream come true--it gave me a real sense of accomplishment to perform not only in France but in other countries as well. ──How did you feel about taking your work to the international stage? SHANTI: I wanted to sing in the way that each song required and have the audience accept that straightforwardly as my music. I hoped they would feel the energy I put into the songs and that that would make them happy in a natural way. So I was quite confident. I thought as long as I focused on giving my all to the songs, the response would be positive. The first audience, in Paris, burst into tremendous cheer and applause after the first song. Their welcome was warm, and their energy built up with each song, toned down with the slow numbers, and climaxed in another round of cheer and applause with the uptempo tunes. Communication between stage and audience was great. I spoke some French in the beginning, the middle, and the end, and slowly in English the rest of the time. In a foreign country I think it's important that you make the first friendly gesture. The Paris audience loved the song from my next album, "Un Monde Meilleur," which I sing in French. I asked a friend, a French singer, to write the lyrics to the Flipper's Guitar tune. I also sang several numbers in Japanese. One was "Miagete Goran Yoru no Hoshi wo" (Look up at the stars in the night sky). But before I began, I briefly explained the lyrics and said that Japanese songs are often about nature because we cherish harmony with nature. I think the audience felt our sense of beauty in the music. On this tour I discovered firsthand that wherever you go, music is a universal language that everybody understands. ──Do your fans in Europe and Japan react very differently? 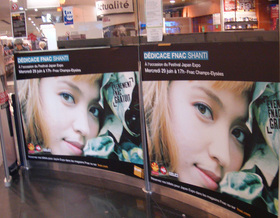 SHANTI: The French tend to express themselves outwardly. Standing ovation, applause, cheering.... Their reaction is very straightforward, so it's easy to tell when they're having a good time. But even in Japan, the reaction differs from one region to the next. Audiences in warm places are more outgoing. For instance, reception is friendly in the southern prefecture of Fukuoka; whereas around Tokyo, where many people live on their own, audiences tend to be "well-mannered." They do applaud, but otherwise they don't really reveal their emotions. They seem to appreciate the music from within. ──Any memorable interactions with your fans? SHANTI: In Germany, someone told me I had a sugar face. She saw me on a poster and expected an idol type that would play pop, electronic music. But after the concert she said, "It's music for the heart." I had wanted my music to touch people's hearts, so I was thrilled that it really did. Also, I performed with a band only on the first night, in Paris, and from then on in a trio--two guitar players and me on vocals. One woman in Portugal asked me to bring the band the next time. There was a wide range of age groups in the audience, from girls seven or eight years old to women in their 70s. This fan was an elegant lady from Germany. She said she likes my music. ──We understand you've won many fans abroad through your work in anime soundtracks. SHANTI: Yes, I gained new teen fans from singing "Sora," which was a collaboration with Yoko Kanno in the film The Vision of Escaflowne, and from writing lyrics and doing narration in Ghost in the Shell: Stand Alone Complex. Some girls printed out my picture from the Internet and trimmed each one into neat postcard-size leafs. Four or five of them came up to me at the concert, like groupies, and asked me to autograph the cards. I took many pictures with the fans, and received a flood of messages on the Shanti Fan Group page I had set up on FaceBook to connect with people outside Japan. "I seldom cry, but I shed a tear with your song." "Loved your show. Glimpsed the world of Shanti through your singing." "You have good French pronunciation." Et cetera, et cetera. Some even put up videos of the concerts on YouTube. The reception was fantastic. ──At the end of the tour you returned to Paris and performed at Japan Expo. What was the event like overall? SHANTI: When I first heard the event aims to introduce Japanese culture, I thought it meant only "pop" culture--that is, I expected everyone to be dressed up in cosplay. True, 60 or 70 percent of the booths were related to anime and characters. But others were dedicated to traditional arts like aikido, judo, kendo, and nihonga (Japanese painting). There were even meditation and zen booths. The festival also introduced takoyaki (octopus dumplings) and other foods, rakugo (comical storytelling), bon odori (bon dance), and shimauta (folk songs of the Amami Islands). Keisho Ohno was there, entertaining some 200 people of all ages with his tsugaru shamisen music. At the bon odori corner, visitors were invited to get on the platform and dance with the instructors. Girls donned in cosplay, faces painted white, were up there doing steps to the classic "Tanko Bushi." The one that goes, tsuki ga deta deta...."
All in all, there was a booth for everybody with an interest in Japan, whether it be academics or cosplay. The event was better balanced than I had imagined. ──What were the most popular cosplay characters? SHANTI: I saw quite a few anime-inspired styles such as Luffy from One Piece and several characters from Naruto. There was also a Hatsune Miku. A group of three or four boys, perhaps brothers, were clad in black and white ensembles that looked handmade. Some of the more elaborate costumes, like robots, appeared rather expensive. Others were clearly made on a tight budget. And yet others, like the schoolgirl uniforms, were straight off the rack, maybe even from one of the costume shops at the venue. A few people were dressed up as Western characters, as if they were trick-or-treating. And even the visitors who weren't costumed at all seemed to enjoy the event as if it were an amusement park. ──What do you think the visitors in cosplay expect of an event like Japan Expo? SHANTI: The people who dress up like to transform themselves and act out their characters. They're totally into it--their eyes and the way they walk. And you can tell they're enjoying every minute of it. Cosplay also seems to reflect a wholehearted desire to connect with the exotic culture of Japan. I met a couple of girls surfing the Japanese in Anime and Manga website at the Japan Foundation booth. One of them said that her love of visual-kei bands sparked her interest in Japanese culture. She was wearing visual-kei makeup herself. After all, France is the capital of fashion. The French are very conscious about how they present themselves to begin with, and even more so when it comes to impersonating their favorite character. Visitors in cosplay who liked each other's costumes were striking up conversations and taking pictures together, even if they started out as total strangers. It seems that Japan Expo was a place for anime and cosplay lovers to gather and make new friends. Compared with the popularity of manga and anime, Japanese music has yet to gain recognition abroad. It seems marketing has a long way to go. SHANTI: I agree. It's unfortunate, really. There are many wonderful Japanese musicians, but only a handful of them present their work outside Japan. With online music stores entering the mainstream in recent years, it's become somewhat easier to access Japanese music from other countries. But record labels have to work harder to supply the audio files. ──Online distribution is certainly slow in Japan. One main issue is copyright. SHANTI: But if they could properly control copyright--by contracting it out to overseas distributors, maybe--the music industry would get a new lease on life. Japanese musicians would be "discovered" by new audiences, which could lead to overseas tours. I was lucky enough to gain recognition through my work in anime. But only a few musicians ever get that kind of chance. ──What do Japanese musicians need to perform abroad? Are language skills a problem? Few speak English. SHANTI: On this tour, for instance, even the staff of a four-star hotel didn't speak any English or French. This was in the suburbs of Spain. They only spoke their mother tongue. Whether in daily life or on stage, it's important to express yourself in the language of the country you're visiting, even if you can only say a few greeting words. It shows you have respect for the people. Your attitude should say "I want to know you better" rather than "accept me." Open your heart first and people will open theirs to you. Don't worry if you can't speak their language well. The important thing is to make an effort and show that you're willing to take a step closer. ──During the tour you collected messages for people in Japan hit by the earthquake and tsunami. SHANTI: Yes, I had notebooks at each venue and said anyone who cared to was welcome to write a few words of encouragement on their way out. A great number of messages--a hundred or so--came from the last audience, at Japan Expo. They were in a variety of languages. Japanese, English, Korean, German, Bulgarian.... Some I couldn't read. Many of them said, "Thank you for your music. Best wishes to Japan." One particularly touching note said, "Come what may, be strong, be one. Your being one will bring happiness and peace. Smile, and everything will be OK. Be strong, Japan." ──As you said, music brings people closer. It fosters friendship. SHANTI: I believe it does. Music always bonds people together, wherever you go. Not only does it connect people from different countries, it also connects people in the same space, because they share that moment in time with each other. After a concert there's a sense of intimacy in the audience. People talk about things and open up their hearts. Music is an essential form of communication. Shanti is a musician born and raised in Japan and bilingual in Japanese and English. Inspired by her father, drummer Tommy Snyder of the Japanese pop band Godiego, she was exposed to various genres of music since childhood. As an elementary school student, she sang hymns in a choir and performed in a musical play. In 1997, after completing a summer program for international students at Berklee College of Music, she began writing music and lyrics for TV commercials, narrating, and performing live in Japan. Her songwriting and vocal talent has attracted countless artists, and she has collaborated in a variety of projects with renowned musicians such as Keisuke Kuwata, Sadistic Mika Band, Char, Kei Kobayashi, Toku, Marlene, Take 6, and Yosuke Onuma. This summer she embarked on a European tour (Germany, Portugal, Spain, and France) and on the last day performed at Japan Expo 2011 in Paris. Since April 2011, she has been the Friday co-host of El Mundo, a new daily program broadcast on NHK-BS1. Shanti, a budding vocalist who has steadily built her fan base and honed her talent with major debut album Born to Sing and second album Romance with Me, releases a mini album of J-pop covers.